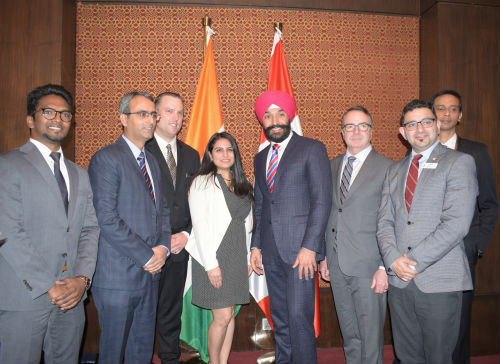 New Delhi: Maple Assist Inc. has launched the Maple Assist App, a ground breaking mobile application designed to be a one-stop shop for all you need to know about studying in Canada. Developed in India, the Maple Assist App is supported by four leading colleges from Ontario, Durham College, Fanshawe College, Georgian College and St. Clair College. It is expected to reach out to over 100,000 international students desirous of studying in Canada, hailing from countries like India, China, Philippines, Japan, Brazil and Mexico. The Maple Assist App was launched by Minister Navdeep Bains, Canada’s Minister for Innovation, Science and Economic Development. The new venture is also supported by Scotia Bank, Air Canada, HDFC Credila, and the Indo-Canadian Business Chamber (ICBC). The launch began with a presentation on how the app works, how it was created and the gap that it fills in the Canadian education market by directly connecting potential students with Canadian colleges and universities. Saurabh Malhotra (Manager, International Recruitment and Market Development) from Fanshawe College, the first adopter of the app, provided a detailed review of the app’s features. Keynote speeches at the launch were given by Mr. Kevin Weaver the Vice-President of International, Workforce Development and Partnerships at Georgian College, and Mr. Mark Herringer, Dean of International Education at Durham College. They were both enthusiastic about joining this pioneering service. As Mr. Weaver remarked, the App would help connect the right students to the right programmes at the right colleges in Canada. Those present included Mr. Arun Pandeya, Country Head, Air Canada, Ms. Nadira Hamid, CEO of ICBC, and Mr. Hitesh Parashar, Country Sales Manager for HDFC Credila. The High Commission of Canada in India was represented by Mr. Anuj Bhasin, Trade Commissioner for Education, and Ms. Terrie Romano, Counsellor (Economic Affairs-Ontario). Vinay Chaudhry, Founder, CEO and the driving force behind Maple Assist shared that as an international student himself in Canada, he had experienced the stress of studying abroad and trying to settle into college life. He said that the Maple Assist app would provide all the information necessary for a stress-free, enjoyable journey for prospective Canadian students worldwide, right at their fingertips. The Maple Assist app is expected to partner with many more Canadian colleges and universities in coming years.